Mid Coast Hospital nurses gather in celebration of Nurses Week 2018, May 6–12. Every year, Nurses Week focuses attention on the diverse ways America's 3.1 million registered nurses work to save lives and to improve the health of millions of individuals. This year, Mid Coast–Parkview Health recognizes more than 600 staff nurses for their unwavering commitment to delivering high-quality patient care. 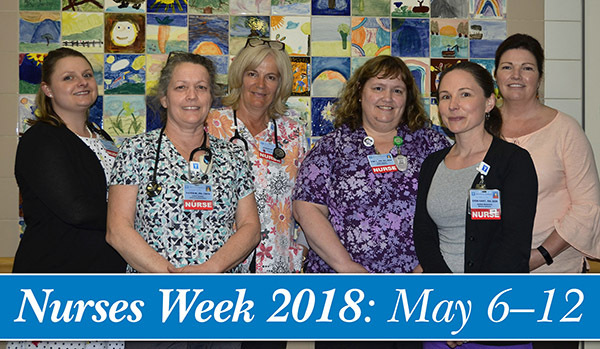 During Nurses Week, May 6–12, Mid Coast–Parkview Health senior administration, direct supervisors, and colleagues honor nurses working at Mid Coast Hospital, Mid Coast Medical Group, Mid Coast Senior Health Center, and CHANS Home Health & Hospice. Special recognition events are planned at key locations. "Nurses week is just one opportunity for us to shine a spotlight on the outstanding nursing team that provides compassionate, high quality care throughout Mid Coast–Parkview Health everyday," said Kristin Anthony, RNC, MSN, NEA-BC, Vice President for Nursing and Patient Care Services at Mid Coast–Parkview Health. "It is due to their leadership and dedication that Mid Coast is nationally known for excellence in patient care." Mid Coast Hospital is the only community hospital in Maine to have achieved national recognition as a Magnet Hospital, an honor bestowed on only 7% of the hospitals in the country for exceptional nursing and patient care. Magnet hospitals are known to have better patient outcomes, patient satisfaction, and nursing satisfaction, as well as lower nursing staff turnover. Almost 200 nurses have joined Mid Coast–Parkview Health in the past year, citing professional advancement opportunities, community level care, and competitive compensation as their primary reasons for joining the team. Individuals can learn more about available nursing careers at Mid Coast–Parkview Health by visiting www.midcoastparkviewhealth.com/careers.